Houses & Homes VA: "Stand Your Ground Laws" – Right or Wrong? 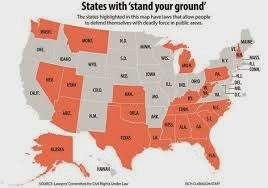 "Stand Your Ground Laws" – Right or Wrong? In light of all of the recent events in our country involving the use of deadly force by police officers I began to wonder if many people are aware of what is commonly referred to as “stand your ground” laws. This type of law states that an ordinary citizen such as you or I have the right to use deadly force if required to defend ourselves from an attacker. More than half of the states currently have this type of law on the books. Basically, a person is not required to retreat if facing a perceived threat and has the legal right to fight back, even to the point of taking another person’s life if necessary. The question is when is it a better idea to flee instead of fight? This is a very complicated question to answer. Obviously, if you are in public and feel that you have the ability to outrun an assailant than that may be your best option. But what if you are in your own home or business? What if you are elderly, injured, or simply feel that you cannot simply run away from the threat? When is the time right to use deadly force to prevent yourself from becoming a victim of violence? These are the types of situations that police officers face every day. Controversy as to when police as well as civilians have the right to use deadly force has never been higher than at this very moment. The Trayvon/Zimmerman case in Florida in February, the shooting of Michael Brown and subsequent riots in Ferguson, Missouri and the more recent unrest in Baltimore due to the death of Freddie Grey while in police custody have sparked a feverish debate the likes of which has not been seen since the civil unrest of the 60’s. It’s a very uncomfortable time in America and one has to wonder when it will finally end, and how. There have been numerous rallies throughout the country scrutinizing the use of “stand your ground laws” since the Trayvon/Zimmerman incident and there seems to be no end in sight. On one side people argue that the bad guys will always have guns and that good people need to be able to protect themselves. On the other side of the argument people feel that such laws are little more than permission to kill in a given situation. So what’s the answer? I wish I knew. I don’t think much of a “vigilante” type society but I think even less of being a victim of violence. Perhaps the true answer is in the hearts of people, something that no law can possibly regulate or control.